A good low voltage communication wiring design and installation is a very important foundation of a security system. It allows for updates and modernization as new technology becomes available. Different features of our amazingly advanced security and alarm systems rely on a proper low voltage infrastructure and good wiring design.The latest technology in security, alarm, and camera systems have so many features and options. All of it is accessed through your network. 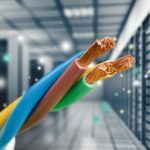 Our expertly trained and experienced technicians tailor your low voltage system with strategic planning to create the perfect cable architect for your specific location in Houston Texas. If your low voltage system was installed and designed with the understanding of new technology and future advancements in security systems options, it gives you the ability to incorporate all of those wonderful new options into your current system without needing to rewire or restructure the whole thing. What are these amazing modern options and features you can access only with your low-voltage system? You want to decide what and where your alarm system cameras are recording and how you will be able to view it. Your cameras are your eyes and ears at your property. Your low voltage system allows you that access. By logging into your system you can access your chosen method of viewing those home or business recordings both in real time and as playback after the fact. The options are limitless. You can sit in your home and observe your kids playing outside or check who rang the doorbell simply on your tv screen. Or it can be a playback video you watch on your phone in your hotel room while on a business trip as you hear of an intruder at your property. In any event, you will be glad you had your accessible system in place. Your low-voltage monitoring system will be hooked up to your home network, so all your systems and features are accessible and controlled by you. Essentially connecting you to your property at all times with no limitations and letting you make changes and react to your needs at the moment. You will love the efficiency of having the ability to control multiple functions of your home in one network. With a professionally installed low voltage communication wiring, you and your Houston property can be in constant communication with each other. Your system will notify you of any changes or problems that arise and you, in turn, can respond with appropriate action. You can also initiate a new action as needed. Be it a door left open by mistake, or a door that needs to be unlocked for a visitor, constantly having access to every part of your system, gives you amazing control and security. To fit your specific security system needs your low voltage system might need to extend beyond the Wi-Fi dimensions you have at your location right now. With our low voltage system, we can extend the constrictions of your current Wi-Fi to meet the needs your system requirements. Full control and automation of your lights, thermostats, fire alarms, music, tv, water sensors, door, and windows are all possible with Megasystems’ top of the line low voltage systems. Designed and installed to fit your exact needs. You will feel in full control of the happenings at your Houston based location. Call us today to start taking advantage of the latest technology in home security alarm systems and enjoy the many benefits a low voltage system offers. Not just to keep your home or business safe but to enjoy your property more as well.